Just under 20 years ago, Tori Amos asserted her sovereignty as her own producer and created the haunting, transporting album Boys for Pele. Nothing else sounded like it then, and nothing sounds like it now: inspired piano-and-harpsichord-based southern gothic rock epics don't come along often. Many critics were confused by it; many of her fans consider it one of her masterworks. Originals like Amos challenge audiences and critics alike, who, with no comparable frame of reference, often are polarized. Such was the case when it was announced that Amos would be writing the music and lyrics to a musical, The Light Princess. 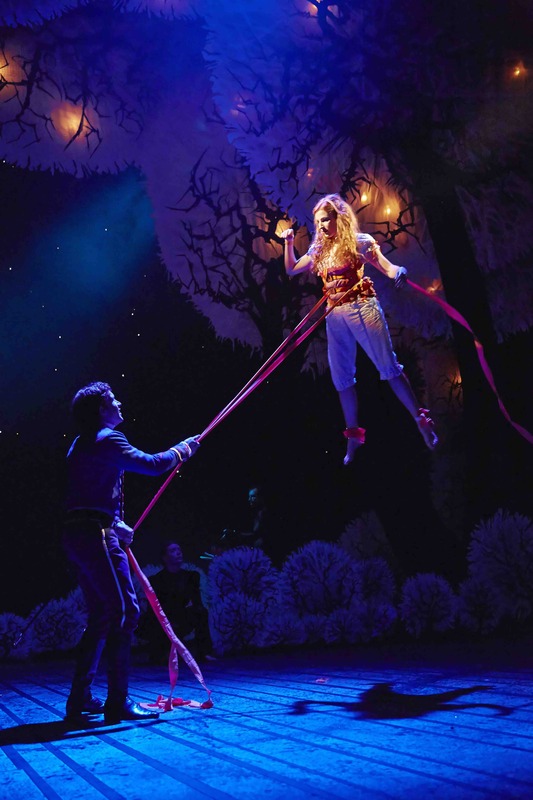 Created by the National Theatre of London as a work of art and unbridled imagination, the play is based on an obscure fairy tale about a princess who is so "light with grief" after her mother dies that she has no gravity. Throughout a series of devastations designed to make her cry and literally come down to earth, Princess Althea can only laugh. Amos and the cast of the play have been hard at work in the studio, and the fruits of their labors will be revealed on October 9, when the original cast recording of The Light Princess is released. In conversation, Amos's ongoing dedication to the project is clear: she hopes the play will make a Broadway appearance, because she wants young people to hear its message. Tori Amos: I think it's important that the album get out to the world. There's some girl in Ohio that's going to play this album and say, "this is my story, too." And then, of course, the next step would be to take it to Broadway -- with the right people. Of course, the storyline and the issues that we're shedding light on is one that will need a brave commercial production team. What is it that the girl in Ohio is going to come away with when she listens to The Light Princess cast recording? Things can happen to you in life -- to her -- that can be so painful that you're not able to deal with the severity of what it brings up in you. It's too painful for you to look at and confront. So, then, you will be forced to take a journey in some way so that even though you think you're not up to it, and even though you think that the road gets so long and challenging sometimes, you think you want to jump off the cliff and possibly end your life, you find an inner strength. An inner light that lets you look at the things that are bringing you pain in your life, confront them, and make changes. That's what I want the girl in Ohio to come away with: she might not have all the tools to make the changes she wants, but she can gather them. The National Theatre took a real chance on the play because of its unconventional nature. Do you think it's possible to pull off art on Broadway? I think it is possible because I think that the demand from the public that want to have a magical evening, and yet walk out feeling really empowered, who are strong enough to look at some dark issues in their own lives. I do think that you can do both, but you need commercial producers that won't betray the teenaged audience and won't dilute the story because I've made a vow to teenagers worldwide -- teenagers who have come and gone in their lives and to teenagers yet to be -- that I'm not going to betray their story. I'm in Washington, D.C., right between the White House and Georgetown, where you got your start playing piano in a gay bar as a teenager. You've said that early in your recording career, producers and record labels tried to force you to replace all the piano on your albums with guitars, but you refused to give up that part of yourself. It just occurred to me that the pressures for you to compromise the nature of your music suddenly strikes me as quite similar to the way young LGBT people have to make a choice about whether to try to assimilate, with potentially dire outcomes, or to be who they are. I was embraced by the gay community at 13, 14, and felt safe. And the community has been part of my family since then. I still get letters from people around the world that feel as if who they are will not be accepted by their families...so the musical is a metaphor for that as well -- that our teenagers have to find the strength within themselves to stand up to their fathers and who their fathers want them to be. And so the fathers set about putting changes in place so that the teenager will change and become the person they think they need to become. I get letters from people all over the world having to deal with that. In some ways, people have changed and are more open. People are able to communicate online. I think that's good. But also, it amazes me how much judgment there is out there. That really amazes me in 2015. Speaking of which, it is election season...since you live part time in the U.K., what's your read of our current political system? Donald Trump, the Planned Parenthood conversations at the same time as LGBT rights, marijuana legalization -- it seems like things are going forward and backward at the same time. Yes. When I hear hateful rhetoric, words being said about a group of people, to try to get votes, it saddens me. You begin to think...it makes me question the whole process. Some of the people running have completely lost their conscience, their moral code. I just can't understand when hate is accepted, when hate is OK. Your last album, Unrepentant Geraldines, includes a song called 'America' that deals with the undercurrent of changes in this country due to immigration -- a cultural shift and a shift of consciousness. That was just a year ago. There's a major political polarization going on right now that I haven't seen in my lifetime. It is worrying. It is worrying, David. There are people all over the world that are concerned and watching, and wondering what we're going to do as Americans. Your album Boys for Pele came out when I was 17 years old and, for all intents and purposes, I was that girl from Ohio. The album helped me commune with some dark realities. Earlier this year, you released remastered versions of your first two albums, Little Earthquakes and Under the Pink. Do you plan anything like that for Pele's 20th birthday? Yes, there's something happening with Boys for Pele in the next several months. We're going to be doing the work for it soon. It should be out in 2016. Ayahuasca...yes, definitely changed my perspective. And I would say to you that the work I did with it at the time, in the late 80s, early 90s, it affects me to this day insomuch as that it has opened up my perspective to realize I needed to listen. I needed to not speak all the time. I needed to listen, and see, and hear what people are saying to me or showing me, what the universe was trying to show me in the moment. It taught me how to do that. The Light Princess got so much attention for its visuals. How do you think it translates to a purely sonic incarnation as it exists as the cast album? Well, I think sonic theatre is a challenge that I wanted to try to achieve with the team. Our team of people were working so that it would explode in your headphones, and so that we could tell the story in sonic detail. We had to make sure that we were clear at all times. And then the booklet that you get, there's a picture with each song that you get -- all the lyrics are there, and there's a photograph from the stage show, so you see the photos of the stage production. And the photos are beautiful. I'm sorry I wasn't able to see the show in London. We're hopeful there will be an American production. Cross your fingers. The Light Princess Original Cast Recording, with two bonus songs by Tori Amos, will be released on October 9.